Tenuta La Bandita is an historical Property of 55 hectares on a hill of the Val di Cornia, only few minutes far from Bolgheri, Castagneto Carducci and the sea. 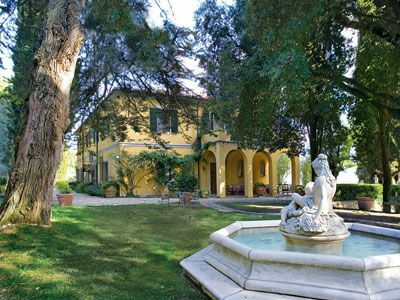 Tenuta La Bandita is composed by a main villa and two depandances. The main villa is a two-storey house with a large panoramic terrace dating back to the 17th century. It has been entirely refurbished and transformed into an elegant and quiet country house. Its large halls, the 10 cosy bedrooms, the furniture, the paintings and the antiques it contains bestow the warm atmosphere of a private luxury home. “La Foresteria” and “Gli Ulivi" are two independent units situated close to the main villa, which boasts 14 comfortable bedrooms, the majority of which having small gardens. The Property has a restaurant with a traditional local cuisine and biological products of the Farm. There is also a chapel for little ceremonies. Tenuta La Bandita is located on the sunny hills of the high Val di Cornia, only few minutes far from Castagneto Carducci, Bolgheri, Marina di Castegneto and the sea. In Sassetta there are several shops and services. In Marina di Castagneto there is a manège and many services. The nearest supermarket is in Donoratico, only 12 km away. The nearest beach is in Marina di Castagneto. Sassetta, 4 km from the Relais.